An American soldier used a Quran, the Islamic holy book, for target practice in a predominantly Sunni area west of Baghdad, prompting an apology from the U.S. military, a spokesman said Sunday. Separately, mortar shells slammed into a residential area north of the Iraqi capital, killing at least four people and wounding 30, most children playing outside, officials said Sunday. The shelling occurred as clashes broke out in Shiite areas late Saturday despite a truce reached last week by Shiite politicians and followers of anti-U.S. cleric Muqtada al-Sadr. Iraqi police found the bullet-riddled Quran with graffiti inside the cover on a small-arms range near a police station in Radwaniyah, a former insurgent stronghold west of Baghdad, U.S. military spokesman Col. Bill Buckner said in an e-mailed response to a query. American commanders then launched an inquiry that led to disciplinary action against the soldier, who has been removed from Iraq, Buckner said. The shooting, which occurred May 9 and was discovered two days later, threatened to further strain relations between the Americans and Sunni allies who have joined forces with them against al Qaeda in Iraq in Radwaniyah and other areas. The Association of Muslim Scholars, a Sunni group, condemned the shooting of the Quran, calling it "a hideous act against the book of almighty God and the constitution of the nation and the source of its glory and dignity." The incident was first reported by CNN, which broadcast a ceremony at which the top American commander in Baghdad apologized to tribal leaders in Radwaniyah. The military confirmed the details in an e-mailed response to a query. "I come before you here seeking your forgiveness," Maj. Gen. Jeffery Hammond was quoted as saying. "In the most humble manner I look in your eyes today and I say please forgive me and my soldiers." The commander also read a letter of apology by the shooter, and another military official kissed a Quran and presented it to the tribal leaders, according to CNN. The military statement called the incident "serious and deeply troubling" but stressed it was the result of one soldier's actions and "not representative of the professionalism of our soldiers or the respect they have for all faiths." The Sunni alliances have been key to a steep decline in violence over the past year, along with a U.S. troop buildup and a longer term cease-fire by al-Sadr's Mahdi Army militia. Bandaged girls and boys with bloodstained clothes cried as they were packed two to a bed at a hospital in Sadr City, a Shiite stronghold where most of the recent fighting has occurred. At least three mortar rounds struck a house, an open area and a street where boys were playing soccer in the Maamil neighborhood on Baghdad's northeastern outskirts, witnesses said. Those killed included a man and three children, according to police and hospital officials who also said at least 30 people were wounded. Associated Press photos showed men holding two dead babies bundled in blankets. Relatives identified them as 1-year-old Zahra Kadhim and 2-year-old Abbas Nadim. 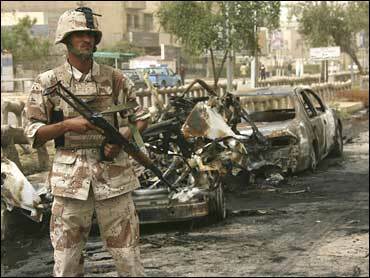 Sporadic gun battles also occurred in some areas of Sadr City, but no casualties were reported, police said. Fighting between Shiite militiamen and U.S.-Iraqi forces has ebbed but occasional clashes continue to break out, casting doubt on the durability of the peace deal reached last Monday. The U.S. military said separately that Iraqi soldiers captured a "special groups" cell leader blamed for coordinating roadside bombings and rocket attacks against U.S. and Iraqi forces, in an operation in Husseiniyah, about 20 miles north of Baghdad. American soldiers also killed two "special groups" militants after coming under attack by a roadside bomb and small-arms fire in the northern Shiite neighborhood of Kazimiyah, according to a separate military statement. The term "special groups" refers to Shiite militia fighters who are ignoring al-Sadr's cease-fire order. The skirmishes in Baghdad came as the Iraqi government has shifted its attention to an offensive aimed at clearing Sunni insurgents from the northern city of Mosul. The military said 15 suspects have been detained in raids targeting al Qaeda in Iraq so far on Saturday and Sunday, including eight in Mosul - six who were linked to a militant leader in the city and two during an operation to disrupt a planned suicide car bombing attack. Iraqi officials say around 1,000 people have been detained in the sweep since May 10. U.S. air strikes also killed six militants and destroyed a weapons cache after troops were attacked by rocket-propelled grenades and small-arms fire near Khan Bani Saad, north of Baghdad, according to a military statement. In violence Sunday, a parked car bomb struck an Iraqi army patrol in eastern Baghdad, killing two soldiers and wounding six other people, police said. U.S. House Speaker Nancy Pelosi, meanwhile, said she "made clear that the war must be brought to an end" as she met with top Iraqi and U.S. officials Saturday during a visit to Baghdad. "It has already taken far too many American and Iraqi lives, it has cost far too much in money and the reputation of the United States, and it has drained far too much from the capability of our military," she said in a statement. The California Democrat led a bipartisan delegation to Iraq.